Like many other companies, PayTollo was created to solve a problem. In this case, allowing a person to easily see tolls and pay for those tolls using a mobile device… avoiding the cash only lanes and unpaid toll invoices that would arrive in the mail, sometimes, months later. With this concept, the founding team members displayed PayTollo at the International Bridge, Tunnel, and Turnpike Association (IBTTA) trade show in San Diego during the summer of 2014. There, the team was invited to the 2015 IBTTA show in Austin, TX to compete in the “SHARK TANK” IBTTA STYLE: FISHING FOR THE MOST INNOVATIVE TECHNOLOGY SOLUTIONS. At the time, we had no idea that the other participants would be Accenture, PToll, GeoToll and GeoTalker. At the end of the five presentations, the award, the win, and, more importantly for us, the validation of our idea, was earned by PayTollo. 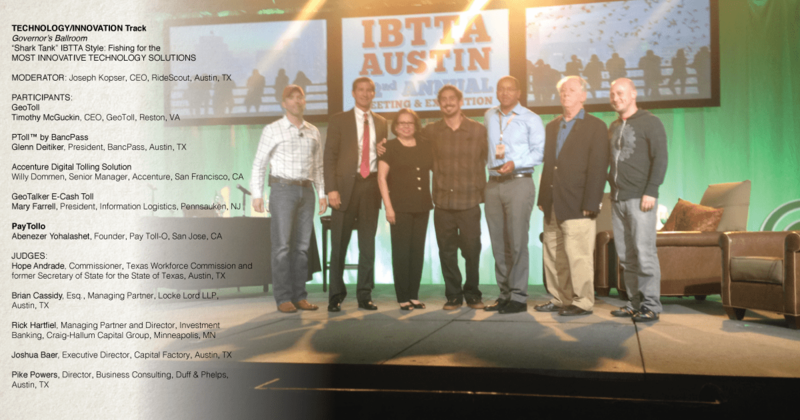 A great deal of appreciation is given to the moderator (Joseph Kopser, CEO, RideScout, Austin, TX) and judges (Listed below) of the event and to IBTTA for hosting. PayTollo looks forward to further industry engagement as we look into the future of tolling.